When autumn officially makes itself known with cooler conditions and rainy days, it’s an important time of year to maintain your home’s exterior. The following tips can serve as your guide to tidy things up, in order to prevent any damage that could occur during the fall and winter months. Your backyard probably has a lot of twinkly lights and lanterns for the evenings you spent out there throughout the summer, but does your front yard have enough light sources? Daylight hours begin to lessen in the fall so it’s important to make sure walkways, the front entrance and above the garage have enough lighting for safety – and ambience. It’s time to seed the lawn and take care of the rest of your landscaping. Trim any bushes and cover any tree trunks, shrubs, or flowers that need extra protection from the cold (or critters). Turn off outdoor taps to prevent them from freezing and potentially bursting. Sprinkler systems should also be drained to prevent similar issues. Check the seals on doors and windows. If any of the weather seals are broken or damaged, cold air can quickly seep into your home while warm air can escape. 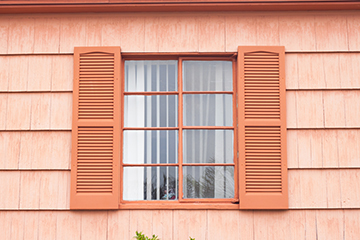 To avoid unnecessary high heating costs, fix or replace the weather stripping on drafty doors and windows. Clean the eavestroughs and gutters to protect your home from serious and expensive water-related damages. Consider hiring a professional since they’ll also check all seams and leaks, flush downspouts to prevent clogging, and make sure everything drains properly. Get those winter tools ready while the temperatures are still fairly pleasant, rather than scrambling when the first storm hits. Stow your lawnmower away after the grass gets cut for the last time (in the shed or back of the garage) and put the snowblower in a more convenient location as well as shovels, ice scrapers, and salt.